Today's fire and explosion investigators work in environments and conditions that are considerably more hazardous than those of 20 to 30 years ago. The widespread use of synthetic building materials and furnishings has greatly increased the amounts and kinds of toxic byproducts of combustion that may result in personal injury, illness, and death. The safety and health of investigators are often taken for granted since most investigators assume that by the time they arrive at a fire or explosion scene, the potential hazards are either eliminated or diminished to the point that they are no longer a concern. However, several studies of firefighter occupational safety and health hazards associated with overhaul operations at fire scenes conducted in Canada, the United Kingdom, New Zealand and the United States since the early 1990's have concluded that numerous toxic byproducts of combustion are usually present well after a fire is extinguished. Several of these toxic substances are poisons or known or suspected human carcinogens, such as acrolein, acrylonitrile, benzene, formaldehyde, sulfur dioxide, hydrogen cyanide, dioxins and numerous polycyclic aromatic hydrocarbons. Investigators face the risk of exposure to these toxic substances during and after overhaul unless proper personal protective clothing and equipment (PPE), including adequate respiratory protection are worn. In recent years, numerous injuries, illnesses, and deaths associated with the investigation of fires and explosions have occurred. Many investigators have been diagnosed with disabling and debilitating injuries and chronic illnesses such as various cancers, that surfaced days, months and years after investigations were concluded. Some occupational physicians believe that these conditions may result directly from fire scene exposures. The majority of the injuries, illnesses and exposures that pose risk to investigators can be reduced or eliminated through the use of a protective ensemble that consists of turnout gear, helmet, boots, gloves, eye protection and appropriate respiratory protection equipment (respirators and self-contained breathing apparatus). 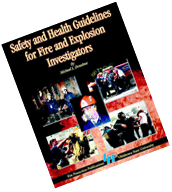 All agencies and investigators must recognize that the duties and responsibilities of fire and explosion investigators routinely require them to work in potentially hazardous environments and the possibility ALWAYS exists that they may be injured or exposed unless adequate policies, procedures, PPE and health and safety training are made a regular part of the job. Certain materials used on this website are the property of different organizations. Accessing these organizations and other sites through hyperlinks requires legal adherence with their respective copyright protection and other provisions inherent within their site and/or documents. However, the content and design of this site (other than the hyper-linked material) are copyright of the Webmaster. This means that downloading, copying and printing materials from these web pages is allowed only for private, not commercial use. Therefore, downloading, copying or printing materials from this site for commercial purposes (including, but not limited to, the World Wide Web) is strictly forbidden without prior written approval of Michael L. Donahue.